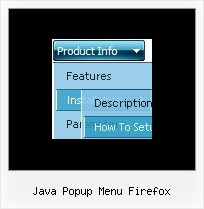 Q: Can I use a menu java scrip Item for text and get the text to wrap within a predefined menuWidth? or use <br> tags within menuItems. Q: I have not put your software into our site yet. I am only working on it in frontpage. However when I have tried to look at it with the browser it does come up with the active x message. Our site has no active x components otherwise. A: Please, try to check browser settings. You can try to see Deluxe Menuon the another computer. On my computer I don't see such message. Q: I have problems with the incorrect copyright in IE7 – I have tried to change as described on your FAQ but it doesn¦t seem to work. A: Scott, now you're using dmenu.js file v1.14 and data.js file of Deluxe Menu v2.0. Please, replace dmenu.js file with the licensed one v2.0. Please, place all this files in the folder where your menu iscreated in. (Process Virtualization) IE8 and Java Issues!! How I can clear JRE cache?